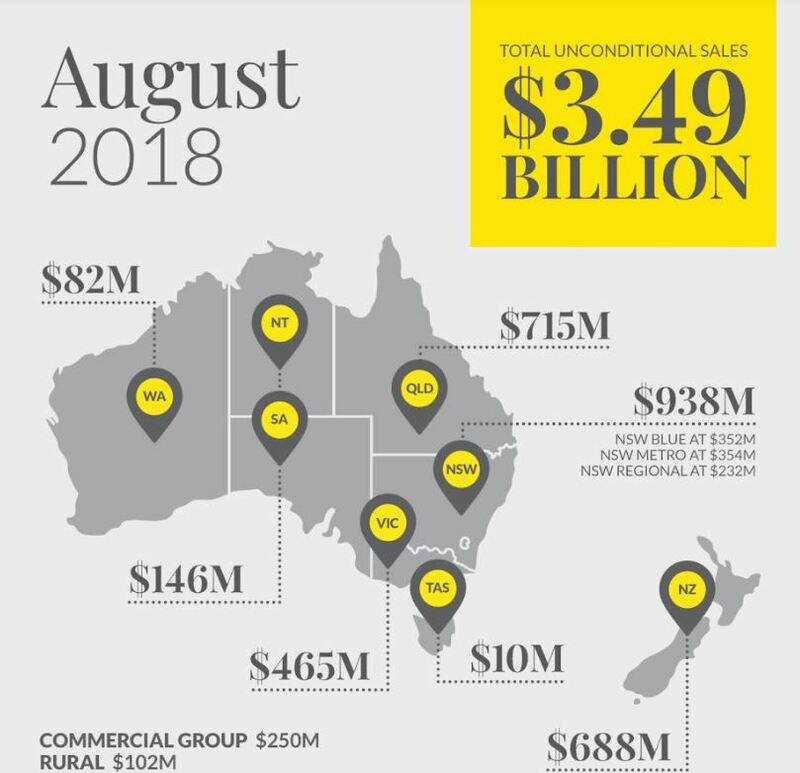 AUSTRALASIA’S housing market correction continued through August and our group recorded $3.49 billion in unconditional sales, which was 13 per cent lower than August 2017. Since peaking in September last year, property values have been consistently tracking lower suggesting spring selling conditions may deliver a challenge amid rising advertised stock levels, tight credit and indications that mortgage rates are tracking higher. We are a broad group across Australia and New Zealand and markets are different across these countries. Sydney and Melbourne were down the most significantly due to a combination of price and lack of activity. The NSW network recorded a 26 per cent fall in sales in August to $938M and there was a 28 per cent drop in total sales in Victoria to $465M. Our market share has been growing across these markets in the last 12 months but the overall market is shrinking. There’s been a number of reasons for this and tightening bank lending conditions is the having a significant impact on consumer confidence. Meanwhile the Queensland network produced a solid $715M, down just 2 per cent year on year, with robust sales and prices achieved across the state with stock remaining tight. We are really looking forward to the spring selling season ahead – in some markets in Sydney and Melbourne – we are seeing stock numbers increase by 30 per cent. So there’s going to be more stock for buyers and sellers to transact and it remains to be said if this will bring confidence back to the market activity. As reported in The Australian newspaper, our chairman Brian White said the majority of the market correction had already now happened. “There has been an adjustment and I believe that much of that ­adjustment has been made,” Mr White said. “The speed of the growth in Sydney and Melbourne was unsustainable. We are experiencing a healthier market.” Markets outside Sydney and Melbourne had been resilient. “Only an explosion in interest rates would pull the market down significantly,” he said. August was a huge month on the Ray White calendar from the annual Leadership Academy with Harvard Professor Boris Groysberg to the Connect 2018 conference on the Gold Coast was a true highlight of the year and we finished the month with the start of our 2018 awards season. I know many people in our network are still talking about Connect. Talk about kicking it high! Some 2500 Ray White agents and Loan Market brokers gathered for the biggest event in our group’s history. 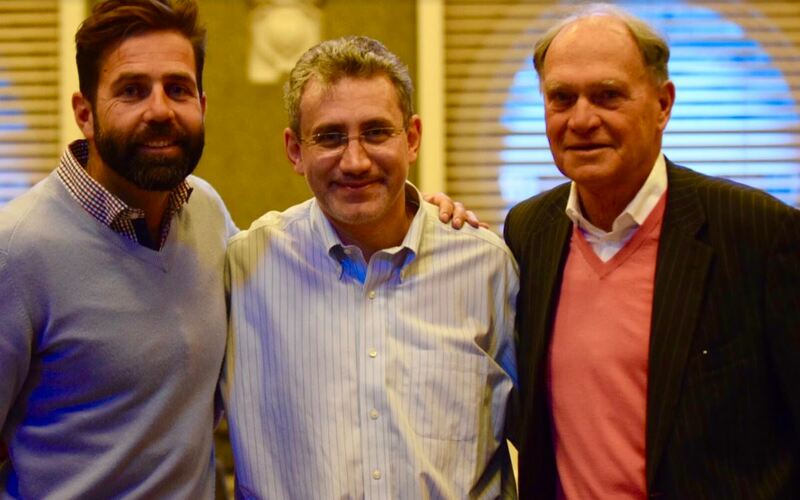 Over two full days, delegates heard from the world’s brightest speakers, attended specialist breakout sessions and networked with agents and brokers from six countries. From John Howard challenging the current housing market to Anna Meares discussing her near death accident and going on to win Olympic Gold – this event had it all! If you missed the auction mash up check it out here. Jenee Bilsborough, Haesley Cush, Mitch Peereboom, Karl Secondis, Anneke and Jason Andrew blew it out of the park with their auction rap. Ray White Remuera was once again been named as the top international office in the Ray White Group for the fourth year in a row. The Auckland business with the blue ribbon address has won this coveted award based on the highest settled commission in the Ray White Group now in 2018, 2017, 2016 and 2015. In case you missed it the annual stats campaign was also released this month with statistics from all over Australia and New Zealand. Click here to view the 2017/18 Annual Stats video. And finally, we welcomed Deborah Brady and Jody Fewster who have opened Ray White Cottesloe Mosman Park in Perth’s affluent western suburbs. With 23 years real estate experience between the owners both bring to the table impressive business experience and professional acumen, and they are a welcome addition to the Ray White family. Still in Perth, Ray White was named as the Top Franchise and/or Network for both listings and value sold in 2017-18 at the Reiwa Awards. Ray White Western Australia CEO Mark Whiteman said it was a great honour to be named as the top group in all of the west for the second year in a row. Ray White is a family owned franchise group, made up of hundreds of different family owned businesses and awards like this are great recognition for our member’s collective efforts. We also welcomed Amy and Ken Maslen who opened their rural business in Gloucester, NSW. The Maslens have been running their family owned real estate businesses in Gloucester for some years, they’re now joined by directors Dee Braithwaite and Greg Wall in opening Ray White Rural Gloucester. They are the same people that their community know and love, and continue to offer the outstanding service they have become renowned for, but now with a new business name and access to the professional tools and support they had been looking for. And in Sydney’s north, we welcomed Megan MacKay, together with her husband Trevor Cain, who just opened Ray White’s office in Frenchs Forest in the heart of the Northern Beaches. The new office, at 49 Frenchs Forest Rd, was minutes away from the soon-to-open Northern Beaches Hospital and Frenchs Forest’s future community hub. Over at Loan Market, the team had a strong month of August. Chief operating officer Stephen Scahill said there was a strong pipeline month with lodgements and approvals tracking well for big increases in the final quarter of the calendar year. The network recorded $1.3B in lodgements, $943M in approvals and $772M in settlements across Australasia. Until next month. Thanks, I’m Dan White. © Ray White City Apartments. Based in Auckland Central. City Realty Limited Licensed (REAA 2008).